I’m going to open the door here for you to liberally make fun of me. I’ve come to terms with it. I’m a nerd. There’s your nerd alert. John and I, (be it to our luck or misfortune) don’t plan our trips out in a very exacting manner. That's putting it delicately. However, before reaching Paris, there was one thing we definitely did discuss at length: our goal to find and enthusiastically pick through every used English bookstore in Paris. Click on this Used English Bookstore Route in Paris to make it larger! Please, crack a joke at my expense now. It helps to normalize things a bit. It is, in fact, the first “tourist” activity that we did. I can’t really explain the excitement, it just was. So we mapped out our Paris Used English-Language Books route (with help from this bloggers list) and were off. 1. The Red Wheel Barrow: We were slacking before we even began—since this store seems to be mostly comprised of poetry and we want something denser for traveling, we skipped it in order to have more time at the other stores. No offense, poetry. 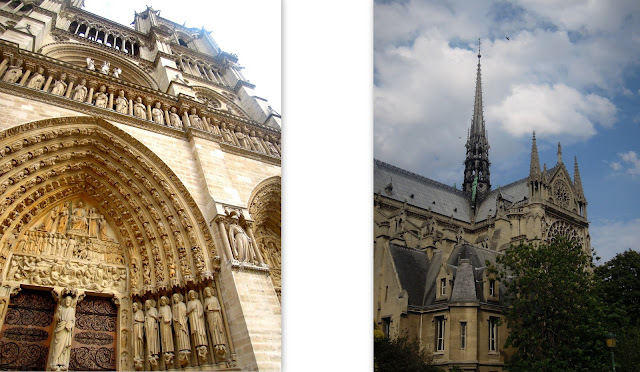 Right in the line of fire, we stopped at the Notre Dame for the obligatory photo shoot. 2. Shakespeare & Co. Unfortunately, we found this store a bit horrible. 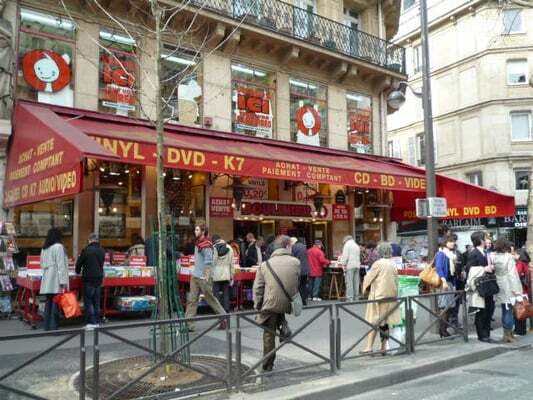 It is clearly the most well-known in Paris and was therefore stuffed—stuffed, I tell you—with tourists. I want used book shopping to be a quiet affair, not one where over the din you hear 16 year-olds exclaiming, “That is so cool that Hemingway used to come here! !” Apart from all the photo-taking and abundant physical contact I found in Shakespeare & Co., I was also disappointed to find that most of the books seemed new and priced as such, and it seemed that most of the used books were upstairs in a “library” where you could read, but not take them out of the store. I can see how this was a wonderful nook before it became more like the inside of a (pretentious?) anthill. Once you arrive at Shakespeare & Co., you are essentially in the Latin Quarter of Paris--a nostalgically Bohemian area that spirals out from the intersection of Blvd. Saint-Germain & Blvd. Saint-Michel. Take time to explore side streets, old antique shops, and general architecture. Check out this link for a good walking tour that you can combine with your used book shopping spree. 3. The Abbey Bookshop A huge selection of books, but everything was so crammed it might be hard to find what you want. I had the pleasure of knocking down a stack of about 12 books because I’m a clutz and narrow spaces filled with stacks of things is never a good environment for the Chowgypsy. I was disappointed in the prices—you’d think that a store nearly overflowing would consider selling a John Updike book from the 80s in fair condition for less than seven bucks. But if you're serious about used-booking and have money to spend, check this place out. 5. San Francisco Books With our apetites having been sated at Boulinier, we had a quick walk through this one. It's on the smaller side, and you can sell or trade your books here for a tiny profit, but hopefully you don’t have to deal with the rude guy behind the counter. 6. Berkely Books This shabby little place was a bit disorganized, but very cute, and the friendly guy behind the counter won our affection quickly enough. You can sell or trade books here, but only during certain times, so check the website first. And there you have it. Our first "tourism" day in Paris. Spent about $10 on six books, saw the Notre Dame, explored the electric Latin Quarter, and came home inspired to cook a (maybe, almost?) Turkish dinner. Recipe for my Ispanakli Bake to come! Sign up here to follow more Chowgypsy explorations! You know, it was not absolutely necessary to out yourself as a nerd, but since you did AND since you are doing such a fine job of dirtbagging your way around France I hereby apply a new label to you. Meggan you are a Nerd-bag. you're really on to something there!